ALLRUSSIAS - The "Union of Unions"
As the revolutionary mood in the country deepened the liberal intelligentsia realized the urgency of forming a united front with the liberal bourgeoisie in order to galvanize its representatives in the zemstvos into making more resolute demands for constitutional reforms. In addition to exerting pressure on the zemstvo liberals, the ‘Union of Liberation’ sought to spread its influence among broader sections of the population. Its tactics included agitation for the setting up of professional and trade unions that would have elected boards (or bureaus). The intention was to join these boards into a unified network of professional and trade unions - a ‘Union of Unions’. The liberals hoped that the ‘Union of Unions’ would bring together not just members of liberal and democratic intelligentsia, but also workers and peasants. They would form a united front to voice moderate political demands as well as to advance their professional and economic interests. The idea of the ‘Union of Unions’ was supported by Socialist-Revolutionaries and Mensheviks but rejected by Bolsheviks. Most of the trade-unions which eventually joined the ‘Union of Unions’ represented intellectual professions, such as university lecturers, writers, lawyers, teachers, doctors, pharmacists, statisticians, etc. It was a convenient forum for expressing economic demands and political positions. 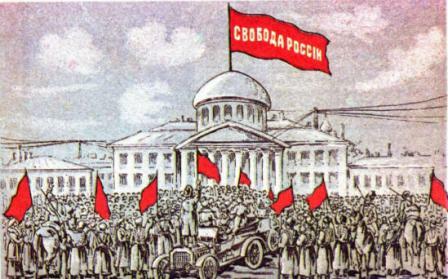 In the course of the 1905 Revolution the ‘Union of Union’ underwent political evolution. Following the October general strike of 1905, it radicalized its demands to reflect the mood of the popular masses. Part of its members who disagreed with this shift to the left quit the organization. The radicalization of the ‘Union of Unions’ did not last, however. After the defeat of the Revolution a large part of the intelligentsia swung to the right, reacting to the change of political situation by a return to the liberal camp. Many abandoned political activity altogether. Others joined the ranks of a new, liberal, political party which grew out of the ‘Union of Liberation’. It was established in October 1905 and was called the Party of Constitutional Democrats (or Kadets). Miliukov became one of its most important leaders and head of its Central Committee. Under normal circumstances, the educated classes would be called upon to act as an intermediary between the government and the popular masses. In the early twentieth-century Russia, however, the attitudes and inclinations of the radical intelligentsia precluded it from playing that vital role. Inspired by a near-religious belief in revolution, it sought to direct the growing social discontent of the working classes towards the goal of the overthrow of the hated autocratic government.